While eyelash extensions offer instant results and gratification – making your lashes fuller, longer, and more dramatic-looking – there are both pros and cons that come with using them. They are accessible and can be bought in the local pharmacy or beauty supply store; at the same time, they last temporarily. With the benefits come certain potential risks, too. Eye sensitivity – This may follow a substance coming into contact with your eyes, leading to irritation. Women suffering from sensitive skin should be very aware of the glue attaching lash extensions, which may result in a rash or skin irritation. The allergic reaction can turn serious and demand medical attention, with worsening signs such as redness and watering (may cause eyes to swell and close shut). Eyelash loss – Of course you are using lash extensions to enrich and thicken your lashes, not lose them! But when you wear these extensions for extended periods, you may cause accidental lash damage. Beware traction alopecia, which is a kind of hair loss that may develop with the presence of excess follicle tension on your natural lashes. Individuals with weaker hair follicles may even suffer from permanent hair loss. Eye injury or infection – Glue and tweezers come in close contact with your eyes when you apply lash extensions, whether on your own or through professional services. The glue attaches directly onto your natural lashes and may put you at risk for irritation and eye soreness. Eye irritation can also happen and lead to serious eye infections. 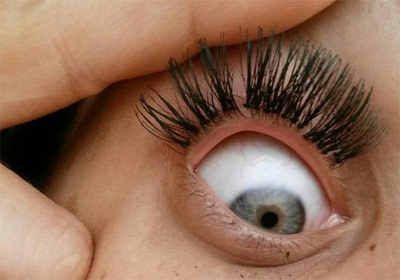 Be careful of bacteria and viruses getting onto lashes through false lashes, which can cause infections like conjunctivitis and affect your vision.